When we were very little and our house on Woodland Avenue was newly built, our driveway was dirt. In those days, people built their houses little by little. Paving the driveway was a luxury that would come in time. In time, Herman saved up the money and had the driveway paved. It’s been fine all these years and every other year, Herman applies driveway sealer to spiff it up. Like all things as they get older, driveways require maintenance. “Driveway Sealing Assistant” is one of my biennial summer jobs at Motel Four. Last summer, Herman and Helen made an executive decision to have the driveway re-paved. They contracted with a local, family owned paving company and a crew of suntanned and shirtless men arrived and magically created a new driveway in a day. The new driveway is my father’s particular pride and joy. A broom to sweep the acorns was no longer sufficient; he bought a leaf blower. A daily ritual began and as much as I protest, Herman makes his own tiny contribution to our long slow ride down Hubbert’s peak. I was late arriving, but I jumped right into it with an old paintbrush, “trimming” the edges of the driveway while Herman applied the larger quantities of sealer with a tool that resembled a flat broom. For some reason, sealing the driveway was hard work this summer and I noticed my father was pretty laid back about it. He’s eighty, after all, and slowing down a little. We ran out of sealer and he left me alone trimming while he went up to the Aubuchon. Left to my own devices, I thought about my good fortune. Here I was, able to spend a whole morning with my father. Even though we didn’t talk much, the time was the important thing. I thought about a hiking trip my parents took a few years ago; they went to Mount Battie, in Camden, and hiked to the summit. It gets a little muddy and steep, but the view from the top is glorious. It’s one of those places people will drive like jerks to visit because Mount Battie and all of Penobscot Bay are the way scenic vistas should be. As people get older, they say grave things like this. I wasn’t prepared for it, though, and it made me nervous inside. I get all teary and anxious and I think about the possible day I say good-bye to my father forever. Usually, I push that thought into the farthest corner of my mind and imagine my own demise instead. Fortunately, at that moment, Herman drove around the corner in his little Mazda truck, grinding the gears and carrying another bucket of sealer. I wiped that tear from the corner of my eye. We got back to work. We finished the job and nothing was said about “last times” and “final sealings.” Herman and I were both lame when we finished. I didn’t tell my parents, but I was lame for more than two weeks. If I live to be eighty, I hope I can still seal the driveway. .
Work is good. Honor your parents if you can. 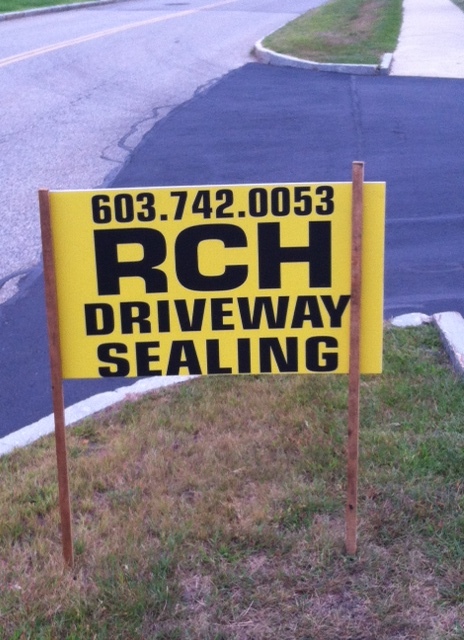 This entry was posted in Weather and Seasons and tagged driveway sealing, Honoring our parents, Mount Battie, Peak oil. Bookmark the permalink.